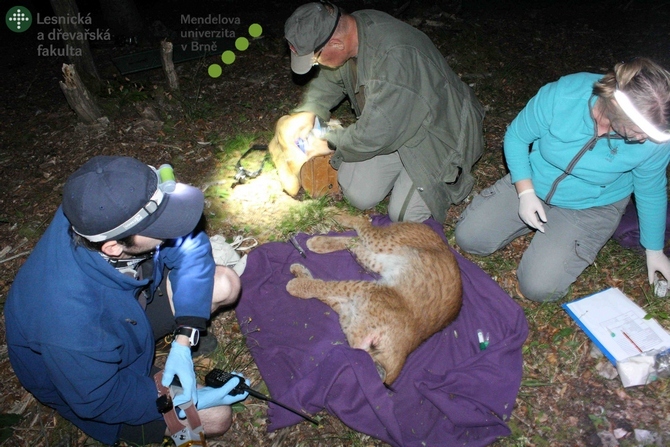 On Thursday evening, researchers from Mendel University in Brno successfully captured the lynx that has been known to inhabit the forests of Moravian Karst since last year. The male, named by researchers Kryštof, was tranquillized and fitted with a telemetry tracking collar. It suffered no harm during the process. Shortly after midnight, Kryštof woke up and ran back into the forest. Telemetry tracking will provide zoologists with a unique opportunity to monitor the movements of the animal living outside of the species' known range. The Eurasian lynx (Lynx lynx), our largest wild cat, has been an unexpected inhabitant of the Protected Landscape Area Moravian Karst at least since September 2016. It was documented by Martin Duľa and Miroslav Kutal, researchers from the Faculty of Forestry and Wood Technology of Mendel University in Brno (LDF MENDELU). Over the winter, the scientists conducted an intensive monitoring in cooperation with the staff of Moravian Karst PLA and experts from the Institute of Vertebrate Biology in Brno. They found numerous occurrence signs and obtained some good quality camera trap photographs. "We can now confirm that the lynx is still present in the Moravian Karst PLA and it is in good condition. In short period of time, the animal has staked out its territory where it is successfully hunting. Since last autumn, we have been able to document the hunting and marking activity of the lynx and obtain samples for genetic analysis. The preliminary analysis told us that it is a male, most likely coming from the Moravian-Silesian Beskydy Mountains." said Martin Duľa, a zoologist at the Institute of Forest Ecology, LDF MENDELU. On Thursday 15 June, after 7 PM, the lynx was captured and fitted with the tracking device. This will provide experts with comprehensive data on animal's activity. The lynx was first photographed by a camera trap on the day dedicated in Czech calendar to Kryštof (Czech equivalent of Christopher) which is how the animal's name was chosen. "Kryštof now wears a radio collar which allows us to monitor its activity in real time. The data we gather in such way will complement our knowledge on the carnivore's behaviour in a human-dominated landscape and help us to understand to what extent the lynx depend on large undisturbed forest areas," added the zoologist. "We have estimated that the lynx Kryštof is about 2 or 3 years old. It weighed 20 kilograms and was in overall good health condition. The tranquillization, fitting of the tracking collar and subsequent waking up of the animal went without any complications. Shortly after midnight, Kryštof walked away from the place where it had been captured," described Jarmila Krojerová, the zoologist of the Institute of Vertebral Biology at the Czech Academy of Sciences and the leader of the team that carried out the operation. The tracking collar, specially designed for male lynx, weighs approximately 370 grams; collars intended for females are usually lighter. The weight of the collar and its overall functioning does not affect the animal's activity and its habits. Also involved in the monitoring of the lynx is the Training Forest Enterprise Masaryk's Forest in Křtiny, which manages the area where the animal was captured. "The fact that the rare carnivore chooses to live here shows that the Enterprise is doing its job. In addition to research and education, we are actively working for nature conservation. Nature-friendly forest management obviously brings positive results," added Vladimír Dolejský, the director of the Training Forest Enterprise Masaryk's Forest. 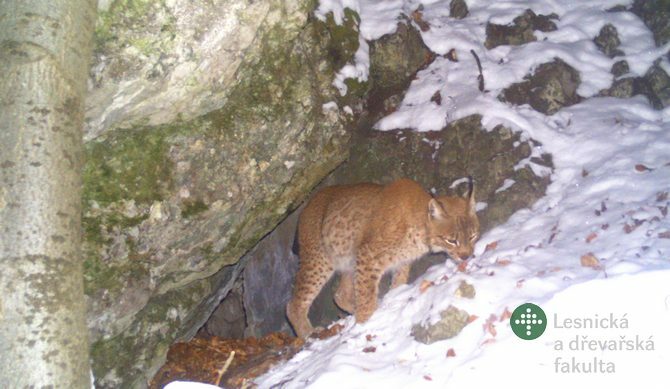 The telemetry research should provide useful knowledge which will be also beneficial for the Administration of the Moravian Karst PLA, where the lynx re-appeared after several decades of absence. "Monitoring the activity of lynx in time and space, knowing where it moves, will allow us to better protect it. We will be able to take measures to reduce certain risks, such as collision with traffic," said Antonín Krása, a zoologist at the Moravian Karst PLA. Friends of the Earth Czech Republic (Hnutí DUHA Olomouc) have been actively involved in the monitoring of the lynx since the very beginning. Miroslav Kutal, the coordinator of the large carnivore monitoring programme, explained: "Closely observing the lynx outside of its usual range of occurrence, such as the Beskydy Mountains and the Bohemian Forest, gives us the opportunity to better understand how these wild animals adapt to life in the cultural landscape. We could also learn some important information about migration corridors used by large carnivores. Better protection of such corridors will also benefit other large mammals seeking new living space in South Moravia."